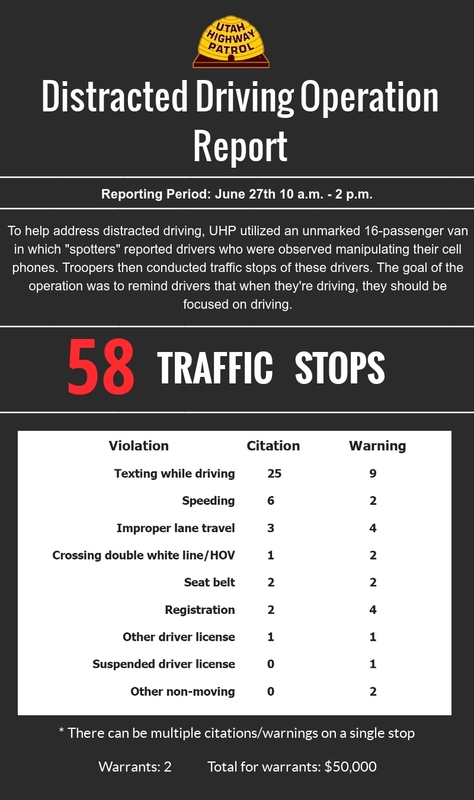 To help address the issue of distracted driving, the Utah Highway Patrol conducted a distracted driving enforcement project operation June 27, 2018. The operation included 6 Troopers, 3 spotters, and 1 driver that focused on distracted drivers in Salt Lake County. This took place on I-15, I-215, and I-80, and utilized a black sixteen-passenger van that will transport the spotters. The spotters looked for distracted drivers, mainly focusing on the manipulation of cell phones, and passed the violation onto other troopers. The enforcement troopers conducted traffic stops on the motorists. Traffic citations and warnings were issued with the goal of getting the motoring public to put down their cell phones and focus on driving. The media was invited to participate and the operation received a good deal of coverage from local news outlets. Many distractions exist while driving, but cell phones are a top distraction because so many drivers use them for long periods of time each day. Almost everyone has seen a driver distracted by a cell phone, but when you are the one distracted, you often don’t realize that driver is you. The National Safety Council estimates that 25% of crashes involve cell phones. Drivers using hand-held or hands free cell phones are 4 times as likely to crash, according to the National Safety Council. In Utah, there were 5,748 distracted driver crashes, resulting in 3,303 injured persons (2016). According to the National Safety Council, there is strong evidence to support that under-reporting of driver cell phone use in crashes is resulting in a substantial under-estimation of the magnitude of this public safety threat. The identification of distraction and its role in the crash by law enforcement can be very difficult. Cell phone records can be difficult to obtain from wireless companies. If cell phone records are obtained, data must align with the precise moment of the crash – a moment which is not always known. Police must often rely on drivers to admit to cell phone use. This is not possible when driver’s are not forthcoming or are seriously injured or deceased. Witness memories and statements may be inaccurate. Police may not fully investigate cell phone use if it’s not a violation in their jurisdiction, if a more obvious violation such as speeding or lane departure is identified, or if a more serious violation is involved such as alcohol or other drug impairment.